The UN's top humanitarian official Jan Egeland has described Israel's month-long military offensive in Gaza as a "disproportionate use of force". Mr Egeland, who is in Gaza to assess the damage, said he was shocked by the targeting of civilian infrastructure including Gaza's only power plant. More than 100 Palestinians have died in the violence in Gaza since June. Israel says its attacks are aimed at freeing a captured soldier and stopping militants firing rockets into Israel. 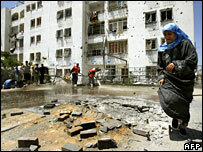 Mr Egeland said that the bombing of the power plant would affect schools and hospitals more than the militants. "This is very clear, a disproportionate use [of power]," Mr Egeland told reporters. "Civilian infrastructure is protected. The law is very clear. You cannot have any interpretation in any other way." Israel launched its offensive in June after Cpl Gilad Shalit was abducted by militants linked to Hamas's military wing. More than 100 Palestinians and an Israeli soldier have since died in clashes between Israeli troops and Palestinian militants. Many of the dead have been militants, but civilians have also died under Israeli fire and air strikes. Israel says it is targeting civilian areas because militants use them as cover to launch rockets, and it is striking infrastructure to prevent militants moving Cpl Shalit around Gaza. But human rights groups say electricity shortages and blockages are threatening medical services and causing businesses to close. Israel's assault has prompted international calls for restraint, but a UN resolution urging Israel to stop the offensive was vetoed by the US at the Security Council earlier this month. Exiled Hamas leader Khaled Meshaal, along with the militants who seized Cpl Shalit, have been insisting that the soldier only be handed over in exchange for Palestinian prisoners held in Israeli jails. However, Israeli Prime Minister Ehud Olmert has ruled out any negotiations with the Hamas-led Palestinian government, calling the militant group a "terrorist bloody organisation".